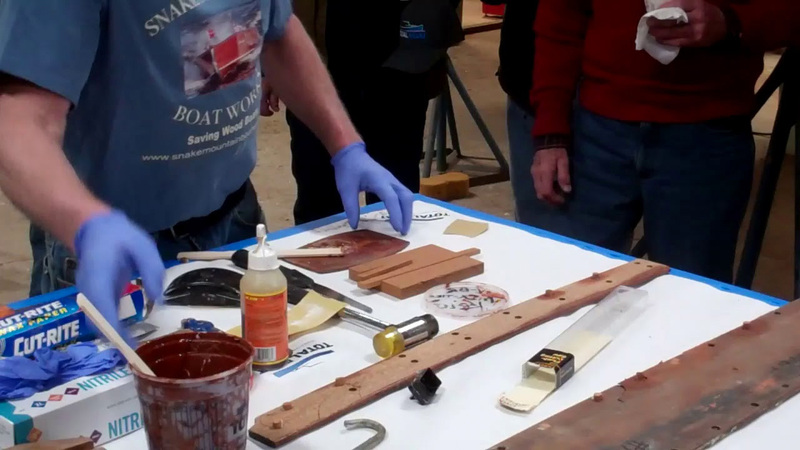 TotalBoat Thixo Wood 2.0 is the current and much, much improved generation of Jamestown Distributor’s wood-colored thickened epoxy adhesive that has a rich, dark brown finish, blends well with many different woods. Making Dutchman patches invisible present similar challenges. Left behind all too often are the hated light glue lines. With Thixo Wood 2.0 and a bit of stain, our bungs and Dutchman repairs are almost invisible. We’ve had similarly positive results wherever gluing wood or filling gaps is required. Uncertain and hugely difficult dispensing bedeviled the original formulation until we began sitting tubes in front of the pellet stoves that heat the shop. Even then we could not be confident that the required 2:1 ratio would be dispensed, and only knew for sure that it was not 24 hours later when the material was still soft to the touch. Happily Jamestown has improved the formula. Thixo 2.0 dispenses in the correct proportions reliably, and, while heating it a bit helps, it is markedly easier to dispense from a standard caulk gun—even in cooler conditions. Yes, some reviewers have commented that it is a bit pricey, but in my world, rarely do price and cost vary together. What will it cost you to remove those bungs and Dutchmen, and the halos they sport if you attempt executing such repairs with wood glue? Viewed within this context, Thixo Wood is a bargain. Previous PostPrevious 1940 16′ Lyman Yacht Tender Bottom Priming!